Looking for an awesome Minnesota Paintball Event or Party? 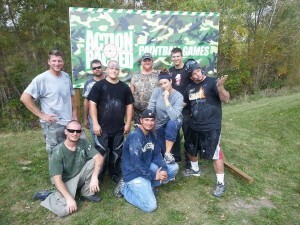 Action Packed Paintball offers the best paintball Walk-On Play, Reservation Games, Private Parties, in Jordan Minnesota! Play paintball with us and make your birthday party or bachelor party a party you will never forget! Reserve a party for any day of the week or play on the weekend without a reservation or deposit! Our referees are your guide to a great day of paintball at Action Packed Paintball. They’ll take you through a new player orientation and safety meeting, where you will be taught everything you need to know about paintball in order to play safely and have fun. Once you are dressed in your gear and ready to get started, they will take you out onto the field and officiate your paintball game. You get to play for as long as you like! Your admission fee allows you access to our MN paintball facility for all day play. We can accommodate groups of 150+ people. We are capable of running games 7 days a week. Use our online reservation system to set up a paintball party or feel free to give us a call at 952-492-6776 if you have any questions!